What would you do to survive? That is the $1,000,000 question in 127 Hours, Danny Boyle’s latest film. The movie is based on the real life story of Aron Ralston, a mountain climber and all-around adrenaline junkie who became trapped by a boulder in the massive Blue John Canyon in Utah in 2003. With his arm stuck between the boulder and a rock wall, Aron is forced to make a difficult decision: stay where he’s at and hope for some kind of miracle (that’s not going to happen), or cut off his arm and live the rest of his life as an amputee? Obviously, as this was a major news story when it happened, most people should be familiar with the end result. It’s one hell of a story, but I had to question how well it would translate to the big screen. 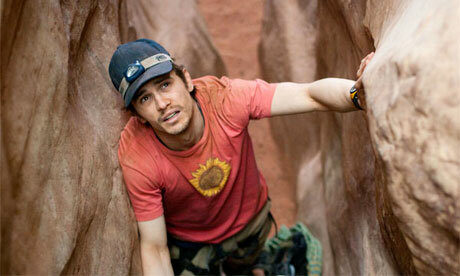 In the wrong hands, there’s no doubt that 127 Hours could have been a disaster. However, this is a Danny Boyle film. The man can do no wrong. His trademark visual styles are in tact, and his frenetic action shots are exactly what this kind of film needs. Still riding high from Slumdog Millionaire, Boyle teamed up with Indian composer extraordinaire A.R. Rahman once again, and the man put together one hell of a soundtrack. The music is diverse and accurately encapsulates the gamut of feelings that Ralston is experiencing on screen. I am ecstatic that these guys teamed up again, and I hope they do so again in the future. Rest assured, this is also the James Franco Show. This is arguably his strongest performance yet, as he perfectly portrays the cockiness and eccentric behavior that is Aron Ralston. We learn more about Ralston’s back story and his thought processes via occasional flashbacks and hallucinations, but the majority of the movie is just Franco in a canyon with his arm smashed against a rock wall. Luckily Franco plays a very likable character, and he keeps things fresh by talking to his camcorder, hilariously interviewing himself and by trying anything he can think of to stay alive and escape. When the movie finally gets to the breaking point of Ralston cutting off his arm (with a piss poor dull knife, mind you), it is some powerful, powerful stuff. It’s a gruesome scene, no doubt, but there is a huge sense of relief when it finally happens. 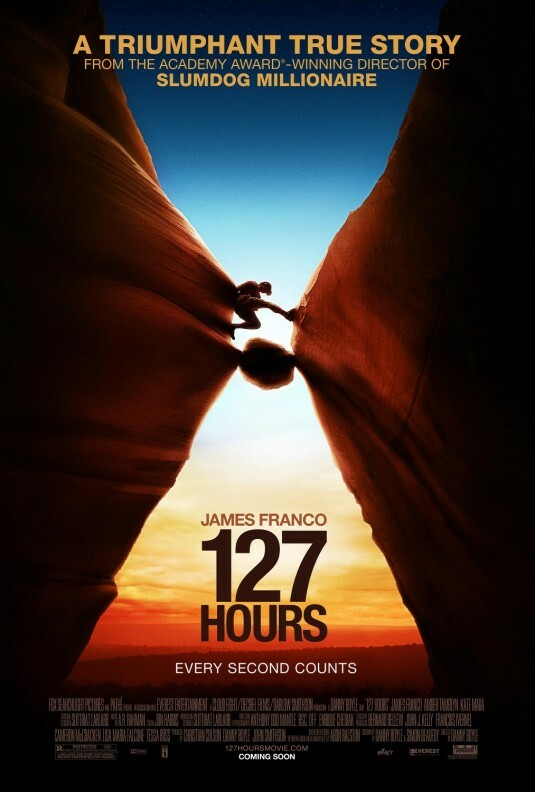 127 Hours is an adrenaline rush from beginning to end, and it should not be missed. A really gruesome flick and really does make you appreciate what a badass Ralston is. Good Review! Haha, no problem there. What’s your verdict?